The future for the dividends of the S&P 500 (Index: SPX) in 2019 looks to be one in which there will be year over year gains, where their rate of growth will peak in 2019-Q2 and then decelerate into 2020. 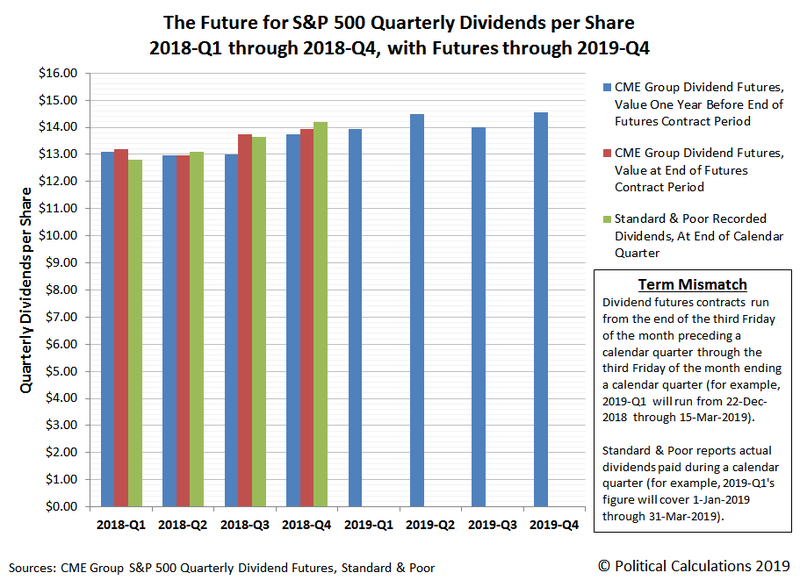 The following chart shows the future for the S&P 500's quarterly dividends per share for 2018 and 2019, as given by the CME Group's quarterly dividend futures. The initial dividend futures indicated in the chart represents a snapshot of the data that was taken some 12 months before the projected end of the indicated quarter, while the final figure represents the last recorded estimate just prior to the end of the indicated dividend futures contract period, reflecting the final measure of how the dividend futures changed during the preceding year. We've also provided Standard & Poor's reported quarterly cash dividends for the S&P 500 for the completed quarters of 2018 to provide a frame of reference for the dividend futures data. Readers should note what we call the "term mismatch" issue with comparing these data sources, which arises because dividend futures contracts run from the end of the third Friday of the month preceding a calendar quarter through the third Friday of the month ending a calendar quarter (for example, 2019-Q1 will reflect dividends to be paid out from 22 December 2018 through 15 March 2019). These dividend futures contract periods conflict with the dividend data that Standard & Poor reports as being paid during each calendar quarter (for example, 2019-Q1's figure will cover all dividends paid from 1 January 2019 through 31 March 2019). While this issue exists for all quarters, we've observed that this term mismatch issue often leads to big differences between the figures that each source reports for Q4 and the next year's Q1 figures, where the dividend futures data considers the surge of dividends paid out right before the end of each calendar year as belonging to Q1. This difference accounts for why the futures data for Q1 appears to overestimate the final figures reported by S&P and why the futures data underestimates the final figures for Q4 each year.